The Varsity Cheerleading team is the epitome of school-spirit and pride. The young women and men enjoy preparing for competitions and cheer at home games for the Mavericks. 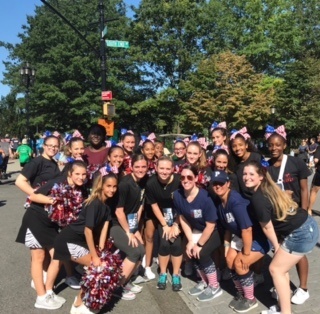 Each year the team volunteers for many community-service events and participates in the Siller Foundation Tunnel to Towers 5K run and walk in New York City. Seventh-year Head Coach, Mrs.Kim Kukal, is assisted by Sue Connors, and Moore graduates Katie Bergin ’07, and Rachel Colangelo ’14. Mrs. Kukal also serves as the CYO Cheerleading Director. In 2016, the cheerleading team finished in first place at the Battle of the Boardwalk in Atlantic City, New Jersey. The team practices twice per week at Moore and one day per week on tumbling and stunts off campus. The Maverick’s welcome all students to join the team and improve strength, flexibility and overall conditioning.